Eggs are a first class protein, in other words, they provide all the essential amino acids the body needs, which much be obtained from the diet. One egg will provide all 8 of these essential amino acids. A lesser-known feature of eggs is the health benefits they can provide for our eye health. The vibrant orange colour of the yolk indicates a rich source of Carotenoids, an antioxidant also found in foods with orange, red and yellow pigments, such as carrots, butternut squash, tomatoes, oranges and yellow/orange peppers. Within this group of Carotenoids, there are 2 powerful antioxidants called Lutein and Zeaxanthin. Studies have shown these to be particularly effective in protecting your eyes, which are susceptible to oxidative stress from harmful light (computer screens, tablets and phones etc). This can lead to macular degeneration with age and antioxidants can protect against this. As fat-soluble compounds, Carotenoids are much better absorbed when eaten with fat and as eggs also contain fat, this makes them an ideal vehicle to deliver these powerful eye-protecting antioxidants. There is also evidence to suggest that eating an egg alongside vegetables can further enhance the absorption of these carotenoids as well as providing more of these nutrients in the first place. 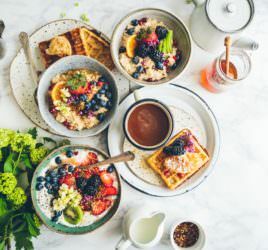 If you’re worried about increasing your cholesterol levels by eating too many eggs, the thinking has now changed following recent research and evidence and current advice is that there is no need whatsoever to avoid eggs on this basis. You can safely eat up to 2 eggs per day, so do include them as part of a healthy balanced diet to help protect your eyes. Aside from their incredible nutritional profile, they are versatile, quick and easy to prepare, convenient, inexpensive and the ultimate comfort food. 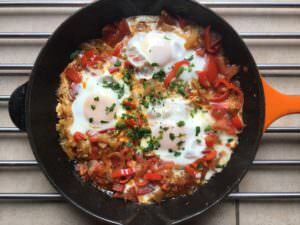 Here’s a recipe for a delicious Spicy Shakshuka, that combines eggs with lutein containing red peppers; perfect for a family brunch or light lunch/supper. 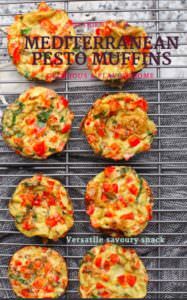 These delicious muffins are ideal for a packed lunch or a picnic choice. They’re great baked ahead, but you can also prepare the mixture in advance and bake them when you need them. Remember…adding colour, adds nutrients!